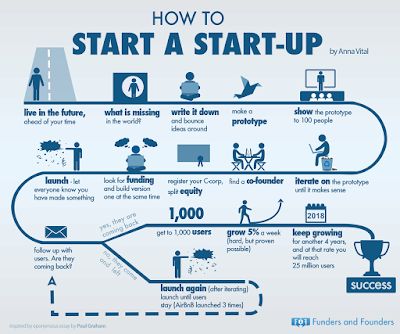 Here is a literal and actionable guide on how to start up. Most of us live in the past or the present. It is easier to analyze what already succeeded and think of ways to replicate the success. It’s thinking by analogy. It is a valid way to think, except that this isn’t the way to create a big startup. Big startups are based on ideas of two kinds – obvious and hard, like Elon Musk’s SpaceX; and non-obvious and hard, like Uber. If you don’t see the obvious and hard or the non-obvious, there is a name for it – “Schlep Blindness”. SpaceX is an obvious idea because the only other enterprise that could send people to Mars, NASA, had no plan to do so at the time SpaceX started. So it is obvious. Because it is obvious and no one else is doing it – a reasonable assumption is that it is impossible. Yet if you live in the future, it will also be obvious to you that humanity will either go to Mars (or another planet) or go extinct at some point. More likely we will find a way to leave this blue pebble. So the impossible must be possible. With UberPool, the idea that at any given point in time there are at least two people going from about the same location to about the same destination is non-obvious. It requires at least three assumptions. It is hard because you would have to gather and store mountains of data about where people actually go in a city. That kind of data analysis is only becoming available now. But Uber thought of it when they offered their first ride back in 2009. They were living in the future. See what is missing in the world. You probably noticed that before Uber, taxi rides weren’t enjoyable. You probably noticed that before SpaceX people were less interested in space. But that is already the past. What is missing now? More importantly what is missing from your life now? No matter how smart you are, you will not remember all your insights. Your conversations with others, random observation, and shower thoughts that are worth following up on. Write these done or lose them. Daydreaming has value. Einstein had another name for it – thought experiment. Most of your thoughts, even the best ones, will never see the light of day sadly. You will forget them into oblivion even if you write them down. The only exceptions are those thoughts you prototype. Make them physical if they can be – program them, design them, do anything that makes them more than just thoughts. Most people will stop right here. So if you do this, you are already ahead of the imaginary curve. Show the prototype to 100 people. Now you will need to step out of your comfort zone and seek out people who will critique your prototype. Ideally, these are both people you already know and complete strangers. Why 100? Because you need a breadth of perspective and hopefully a pattern to recognize from all the feedback. Although a few people will get it right on the first try, the odds are you will not. So prepare to redo everything from scratch. This is your “founder MBA”, except it is free. When the prototype starts making sense, go find another person who will pour a decade of their life into this project because it will change the world and they probably don’t have a more meaningful thing to do in life at the moment. Split equity. Finally, an easy step. Get a lawyer who will register your company. Give your co-founder as much equity as will make them work their hardest, while you keep as much as will make you give it your all. Look for funding and build version one. Unless you have enough savings to build version one, go find an investor. While you are doing that build version one. You have to keep building because there is no guarantee about when or whether you find an investor. Don’t assume that you will just because other startups are getting funded. Assume the worst, and build your product. By the time there is even an iota of usefulness in your product, launch it. Extra features, better interface, faster load time and other optimizations probably won’t save it, if the core features have no use. Are users coming back? Find out why they are not. Launch as many times as it takes. At some point, if at least a few dozen people are coming back on their own, you probably made something valuable. This may not seem like a lot, but the first 1,000 users will show the weaknesses of what you have built. You probably will have to recruit them manually. How manually? Take their computer and open your website for them. Whatever it takes. Paul Graham encourages startups to grow at least 5% a week. If you grow that much, within 4 years you will get to 25 million users. In other words, you will be one of the largest startups. Success – whatever that is. You can IPO, sell your company to another or stay private by convincing investors that there is a bigger liquidity event coming. Even now, though, you may or may not have made the world better. WebVan IPO’ed, but quickly disappeared. Think about what kind of a dent in the universe you want to leave with your startup. 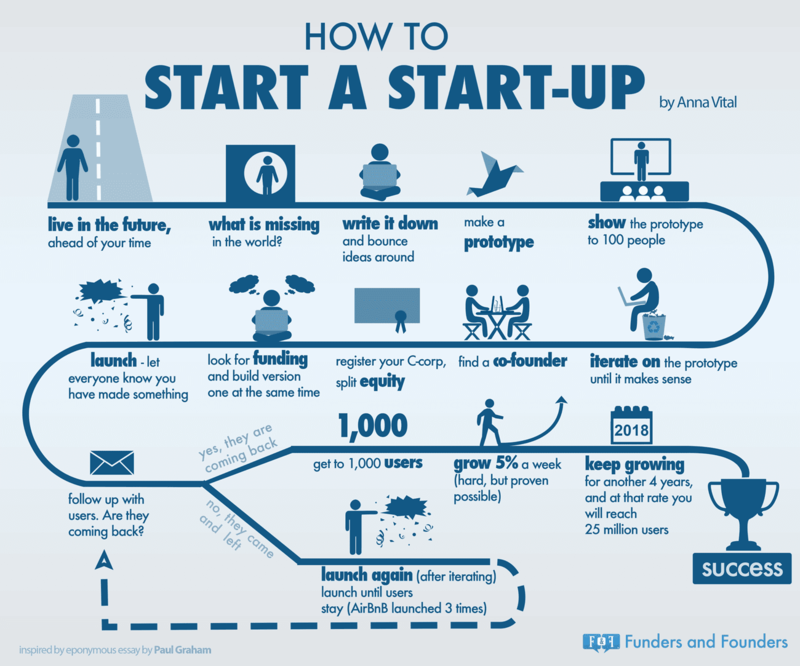 Inspired by Paul Graham’s essay “How to Start a Startup”.